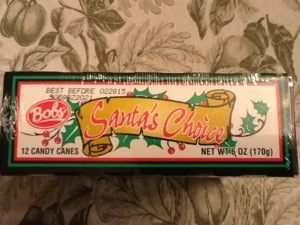 Have you ever had an extra box of candy canes after Christmas, and wondered if they’d keep for another year? Well, the answer is yes, and they’d still be good after 2 years. Look at the date on this box from 2012…. Good until Feb. 28, 2015! However, if you live in the humid, deep-south, all bets are off. We know how nasty and sticky humidity makes candy. So, in closing, hold onto those canes if you wish. Merry Christmas Eve, eve. Posted in chewy candy and tagged candy canes, holidays. Bookmark the permalink.